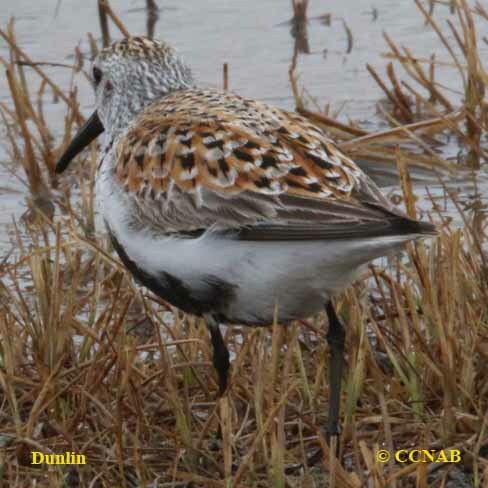 There are two sub-species or races of Dunlin that are more commonly found in North America. These are the Dunlin (Atlantic) and the Dunlin (Pacific). As the names indicate, these shorebirds are divided up by the location of the birds and the Atlantic and Pacific Oceans. Some of the obvious differences is the Dunlin (Pacific) has a lighter coloured body, whiter neck and face. The black spotted area of the lower breast and upper stomach is noticeably larger. Dunlin are seen throughout North America and are also seen in Eurasia and Africa, depending on the time of year. This shorebird was once known as the Red-backed Sandpiper. The Curlew Sandpiper is very similar to the Dunlin and is a vagrant visitor to the North American continent. It is a bird to watch out for.